Mary-Beth Cooper says her dog, Dakota, feels right at home on the picturesque Springfield College campus. And the same can be said for his owner, the 13th president of the 128-year-old school and the first woman to hold that title. 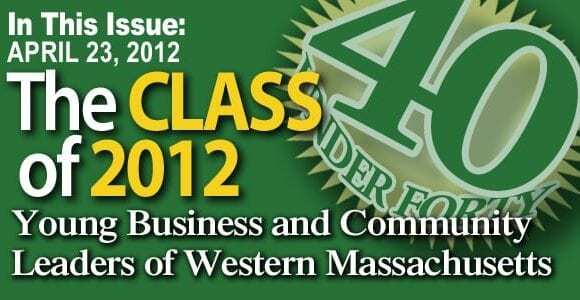 She told BusinessWest she was comfortable with the institution long before she actually toured it, and even well before her first two interviews for the position, the first via Skype and the second at a hotel at Bradley International Airport — although those sessions and her subsequent visit certainly reinforced her opinion. She liked the feel and the fit so much that she quickly terminated a quest for another college president’s position to focus all her energies on this one. The primary reason why is the culture that pervades the school, one summed up by its motto (“Spirit Mind Body”), she said, noting that she was aware of it from work she had done, first as a volunteer and later as chair of the board, with the YMCA in the city of Rochester, N.Y., where she served as an administrator at both the University of Rochester and, later, the Rochester Institute of Technology. Springfield College and the Y organization share a unique history, she said, noting that the college was once known as the International YMCA Training School, and there is still a strong relationship today. From that connection, she became familiar with the college’s humanics philosophy to educate the whole person. 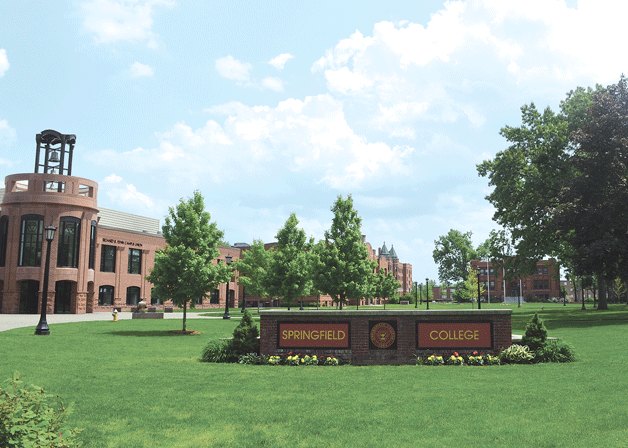 But there were other factors that made her comfortable with the school located on the shore of Lake Massasoit, she said, listing, for starters, many similarities between Springfield and Rochester, and also between the work done within the community at both Springfield College and the Rochester schools she served. Both cities are former manufacturing centers still trying to reinvent themselves, she said, noting that, while Rochester once boasted such industry giants as Kodak, IBM, and Xerox, its major employers today are those aforementioned colleges and a supermarket chain. Mary-Beth Cooper says she understands the relationship between a college and the community. As for work within the community, she said the schools in Rochester and Springfield College have strong track records of caring that are part of the institutions’ fabric. At SC, this tradition is perhaps best exemplified by the recent Humanics in Action Day, during which students, faculty, and staff (including Cooper) performed a day of concentrated community service throughout Springfield involving roughly 100 specific projects. 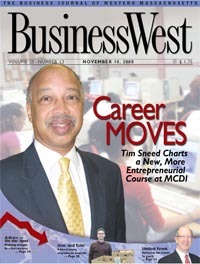 As she talked with BusinessWest just a few weeks after taking the reins at the school, Cooper noted that her predecessor, Richard Flynn, had registered some notable accomplishments in recent years — everything from increasing enrollment to significant building and renovation projects on campus, to several new academic initiatives, including an MBA program unwrapped in 2011. Meanwhile, he established and strengthened relationships with a number of constituencies, including the YMCA and Springfield City Hall. “He did a lot of the hard work and left me in a good position,” she said with a laugh, noting quickly that there is still plenty to do in the months and years to come. At the top of that list is raising the school’s profile, she said, adding that, while it is well-known regionally, the college is far more of an unknown commodity in other parts of the country. Also, while enrollment has risen, there is still room for improvement, and also a need to broaden the applicant pool for this school known for everything from its affiliation with the Y to its diverse degree offerings in health and fitness, to its strong graduate programs. 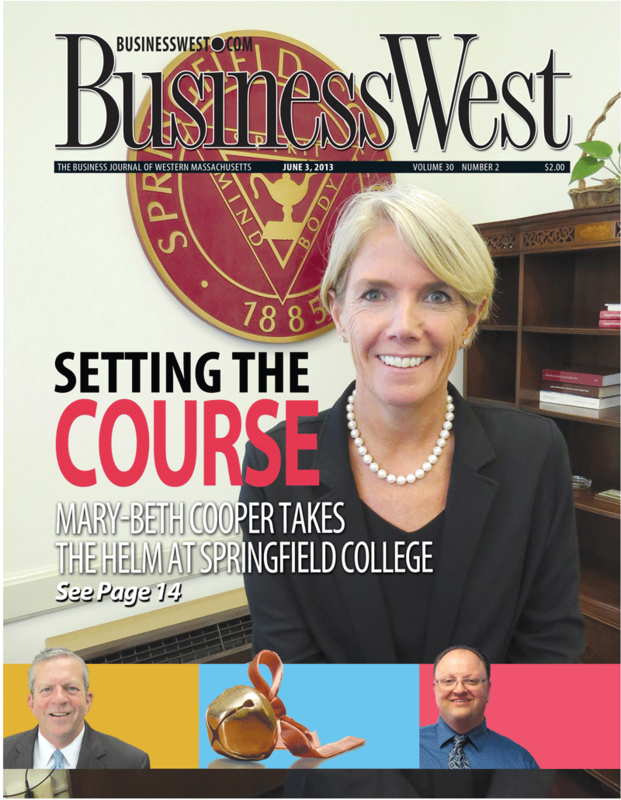 For this issue and its focus on education, BusinessWest talked at length with Cooper about her latest career challenge and how she intends to build on the progress recorded at this venerable Springfield institution. 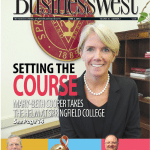 Roughly five years ago, Cooper told BusinessWest, she decided that, from a personal- and professional-development standpoint, her next job in higher education should be as a college president. However, her son, Calvin, was a sophomore in high school at that time, and she had basically already made another very personal decision — not to disrupt that important time of his life with a move to another part of the country, and to wait until he was at least a freshman in college to make such a career move. Last fall, with Calvin firmly entrenched at the University of Delaware, she started looking at opportunities to lead a college campus, and was actually fairly deep into the process of applying for a job when friends and colleagues, including the director of the Greater Rochester Y, urged her to train her sights on the position at Springfield College she had seen posted in the Chronicle of Higher Education. That definition fits everything from sports — and she’s been involved with them for most of her career, and continues that pattern today — to what would be considered ‘town-gown’ activities and relationships. Prior to that, she served as dean of students at the University of Rochester and vice president for Student Affairs at St. John Fisher College, also in Rochester. This is not a traditional path to the president’s office, she noted, adding that many campus leaders today still come from the academic or development (fund-raising) realms. But she said her background has provided tremendous insight into how a campus functions and how a school can, and should, become involved in the community. And she does have some background in academics, having taught as an adjunct professor at the University of Rochester’s Warner School of Education for many years. Meanwhile, she has a strong track record of work within the Rochester community, working with both the YMCA and the United Way in that city, among other endeavors. In 2005, she was named one of the city’s “most influential women” by the Rochester Business Journal. She said her work with the YMCA was particularly eye-opening, providing her with insight into the needs of a community and how an educational institution can help address them. “As a member of the administration at the University of Rochester, I began to learn what that community needed,” she explained. “And for me, it was an opportunity to think about youth, families, affordable daycare, and the plight of a population much different than the students at the college. It was an interesting time for me, and it helped me understand the relationship between a school and a community. Obviously, they did, as she prevailed in what she called a “robust” search at Springfield College that involved more than 100 candidates, including some sitting college presidents. She said she’s proud of being the first woman president at the school, and believes the choice represents another bit of progress when it comes to putting more women in the corner office on college campuses. But she contends that gender remains an issue in too many hiring scenarios. Since arriving on campus, she’s been very busy meeting with students, faculty, administrators, and other on-campus constituencies, and has met with Springfield Mayor Domenic Sarno to discuss the community and the school’s role within it. She’s also taken in a number of Springfield College sporting events, including the recent gridiron triumph over Western New England University, attended the Basketball Hall of Fame induction ceremonies last month (the game was invented at Springfield College, and the first hall of fame was located on the campus), and has commenced a search for a running club to join. “I’m not very fast, but I can run long distances,” she said, adding that she’s looking forward to getting out into the community in the months ahead and gaining a full appreciation of the challenges facing the region and the ways the college can help address them. Since she first interviewed for the job — and especially since arriving on campus — Cooper said she’s been somewhat overwhelmed by the positive sentiments and equally positive energy that exists on campus, within the alumni ranks, and what could be called the Springfield College community. “I’ve never been to a campus — and I’ve worked at several, big schools, small schools — where people speak so favorably about the institution,” she told BusinessWest. “Whether it’s alumni, parents, current students, staff, faculty … it’s almost unbelievable. And so something right must happen here in terms of what the experience is like. While it’s not her official job description, maintaining this steady flow of positivity is Cooper’s broad mission at the college. She said the philosophy she will take to this assignment is to resist resting on the accomplishments of the past several years and instead build on what’s been accomplished. Efforts to continue growing enrollment are certainly part of this equation, she said, adding that, while she has no specific goals in mind, she believes there are opportunities to increase the numbers of both undergraduate and graduate students. This can be accomplished through a combination of more aggressive marketing and awareness-building efforts, she said, adding that one of her priorities is to tell the school’s story through every vehicle available to do so, and especially ongoing efforts to anticipate the needs of both students and employers and then meet them through effective academic programming. Elaborating, she said the school must maintain and sharpen its focus on properly preparing graduates for the rigors of the workforce and the specific challenges of their chosen fields. And with that, she summoned the phrase “cross discipline,” which she used to describe the path higher education must take in the future. Elaborating, she said that what students want — and need — today is the ability to couple study paths, such as a major and a minor, two majors, or a four-year degree with an additional one-year MBA, to enhance their odds of succeeding in a profession. And while focusing on what happens in the classroom, Cooper will also work to find new avenues to express that commitment to service that was one of the many factors that drew her to the school months ago. Overall, she said, the challenge moving forward is to continually enhance what the the school can offer to students in terms of the “total experience,” but without eroding the traditions and programs the school is noted for. Summing up her first month or so on campus, Cooper said it’s been a whirlwind of meetings, large and small, with a wide range of constituencies that, as she said, want her ear. Through all that talking and especially listening, she’s become even more convinced that she, the school, and its culture constitute a perfect match. Like the First Dog, she’s very comfortable in her new surroundings.